Middlebury bed and breakfast travel guide for romantic, historic and adventure b&b's. 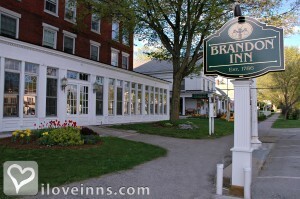 Browse through the iLoveInns.com database of Middlebury, Vermont bed and breakfasts and country inns to find detailed listings that include room rates, special deals and area activities. You can click on the 'check rates and availability' button to contact the innkeeper. Located on the coast of scenic Lake Champlain, Middlebury is a perfect spot for boating, kayaking, and canoeing on Lake Champlain. The Nature Center is a favorite and there's Otter Creek Brewing, Chipman Hill, and Halpin Bridge to discover. Nearby are Salisbury Fish Culture Station, Chimney Point State Historic Site, Larrabees Point, and Israel Putnam. All these are just a few miles away from Middlebury. After a day of fun and touring around, book a relaxing massage at Simply Serenity Spa before going back to your Middlebury bed and breakfast inn. By The Middlebury Inn. New Haven, VT is five minutes from Middlebury College on Route 7 North. Middlebury is a charming, quintessential New England town with a wonderful downtown full of art galleries, bakeries and unique shops. New Haven is also 45 minutes south of Burlington, VT on Route 7 South. By Tourterelle Restaurant & Inn.